The moment you have a hero's mansion level one you can make a normal unit a hero. This means that you need a stable or barracks before you can create a hero. The hero can be sent as a reinforcement to other villages like every other unit. However if the village is yours and you have built a hero's mansion there prior to sending the hero, you can use the hero from this village as if it had been created there. When a hero is trained he has 5 skill points that can be used to increase his 5 abilities. Ability levels can be increased up to level 100. Each time a hero gains a level he earns 5 additional ability points that can be used to increase his 5 ability levels. Points put into this ability increase the attack value of the hero. Points put into this ability increase the defence value of the whole army by 0.2% per point (maximum of 20%) This bonus only applies if the hero is defending with the army. Other defending troops not under your control will remain unaffected by this bonus. Points put into this ability increase the regeneration rate of the hero. After upgrading a hero's mansion to level 10, you can use your hero to occupy oases in your surroundings. At building level 10 one oasis can be occupied, at level 15 two and with a hero's mansion level 20 three. 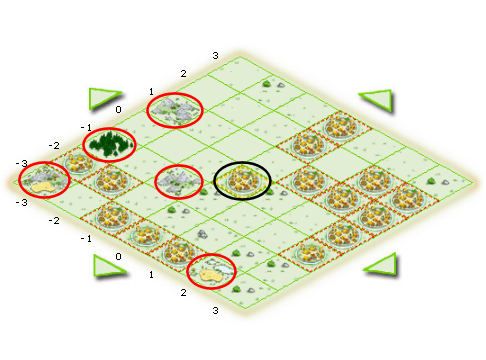 The oases you want to occupy have to be within the 7x7 square around your village. Conquering player owned oases is possible, too. You need to have at least one open slot in your hero's mansion. Player owned oases can only be conquered using a normal attack. Remember that you have to send your hero along or you cannot conquer the oasis. If the village you are attacking already owns three oases at the time of your attacks the first successful attack will lower the oasis' loyalty from 100% to 0% making it yours. If it already owns two, the attacks only lower the loyalty by 60% and if it already owns one the loyalty will decrease by only 40% in a successful attack. Troops with higher stat values (attack and defence) are, of course, better and stronger than troops with lower stat values. The reviving costs of the stronger troops are higher than those of the inferior troops, though. Players can own a pool of three heroes and every time the active one dies the player may choose one of the three to be revived. Is it possible to assign rams, catapults, settlers, spies or administrators to become heroes? - No, that is impossible. Do I have to create 3 heroes first before I can delete one? - As long as a hero is dead he can be deleted, regardless of how many heroes you have. Does a hero get improved by upgrades done in the armoury and the blacksmith? - Each player can only have one active hero. If this hero dies, the player will have the option to choose one of up to three inactive heroes (including the newly dead one) that (s)he wants to have revived. - Yes, as long as the village you move him to has a hero's mansion. © 2009-2019 ! !Travian Games GmbH!! | ! !CustomerSelfService v4.6!! | ! !Given answers: 367627!! | ! !Available answers: 237! !